Niche cycling publisher Mousehold Press has followed up Graeme Fife's biography of British cycling pioneer Brian Robinson with a book on Shay Elliott, the first Irishman to wear the Yellow Jersey. The two books sit well together as companion pieces and provide an insight into the early years of British and Irish cyclists on the Continent. Elliott's biography is inevitably a bleaker book that Robinson's, with the Irishman joining a long list of cycling stars (Marco Pantini, Tom Simpson, et al) to have died much too young. But it is also a celebration of his life and career. 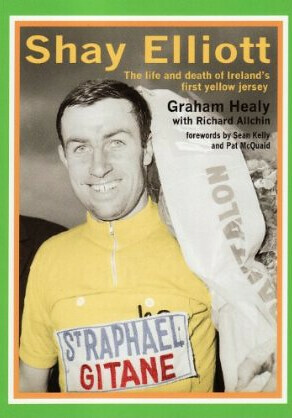 Graham Healy and Richard Allchin's biography is a personal and detailed account of Elliott's formative years in Ireland, his early influences and his first foray into Europe as an amateur in 1955 (L'Equipe wrote that "if a yellow jersey for amateur road racers had been given, Shay would have taken it right from the beginning of the season and kept it up to the end"). He turned professional the following year, signing with the Helyett team alongside Jacques Anquetil, and basing himself in Paris, where he embraced both the French language and the culture. Elliott went on to become the first rider from an English-speaking country to win stages of both the Giro d'Italia and the Vuelta a España. In 1963, he won stage 3 of the Tour de France and claimed the Yellow Jersey. Healy and Allchin have sympathetically pieced together Elliott's life (he is referred to as 'Shay' throughout), using personal recollections from Elliott's family and friends to provide an intimate portrait of both the man and the cyclist. Shay Elliott: The Life and Death of Ireland's First Yellow Jersey by Graham Healy and Richard Allchin is published by Mousehold Press. It's available in paperback in the UK. See also Brian Robinson: Pioneer by Graeme Fife, a biography of the first British cyclist to win a Tour stage.